Yesterday I read a story that said having Botox might make you look more stupid (as apparently people think those whose eyes crinkle are more intelligent). Today I’m reading one (contradicting past beliefs) that because it inhibits the full range of movement when you smile, having anti-wrinkle jabs might also make you more depressed. I’m therefore expecting people to start talking to me loudly and slowly over the next couple of months. Maybe using shorter words when they explain things. And there might be a lot of Leonard Cohen on the iPod – because right now, much of my face does not move. I have experienced a Botox Mistake. I’ve always been upfront about the fact that I have Botox. I have done since about 2004. I love the way it looks and, until now, I’ve never had a less than perfect result. I suppose with those odds I had a Botox mistake coming to me. I hadn’t seen my jabber for a year – it wasn’t really a conscious decision. I normally wait six months before treatments as I like to keep a sense of perspective about what I actually look like. It’s too easy to slip into the frozen face trap if you’re not sure what’s normal. Six months had slipped into seven, seven to eight – and, you get the picture. However I had noticed new lines appearing where I hadn’t had them before and I was looking tired and overall I was looking my age and wasn’t thrilled about it – and so I booked in. The appointment came and I trotted off the clinic. I filled in the consent form. He got out the needle. We talked about the weather and some other bits and bobs. And therein lay my fatal mistake. We didn’t talk about my face. Stupid. Stupid. Stupid. Unlike my past doctors, this clinic don’t keep notes on what they normally do to remind the doc before he jabs. Instead, you fill in a new consent form each time and that’s that. I completely forgot that and just assumed that the doc would remember that I only like the minimum dose so my face moves everywhere – but the bit between my brows. He obviously assumed I wanted the full face monty – after all I hadn’t been there for ages and he had a nice crinkly canvas to work on. I knew it was going a bit strange when I started jabbing along my hairline. Normally, we never go that high. Then before I knew it he’d jabbed the bunny lines on either side of my nose as well. At this point I mentioned that there was more going in than normal, but I was hoping that maybe he was just doing half squirts or something and that I’d still retain my much-loved ability to raise one eyebrow. Erm, no……As of this morning, nothing above my brows is going anywhere. I can’t be angry (no pun intended) – yes, he should have asked me what we were doing, but considering I’m very specific about what I want from the treatment, I should also have spoken up before the needle went anywhere near me. And, it will only last at full strength for a month or two anyway, it’s not like I’ve had a bad facelift and am stuck with this forever or even that I’ve had one of the really noticeable bad results like a droopy eye or lowered brows. In fact, when my face is at rest, it looks lovely. I’m seriously line free and perfect. But woah, it’s weird. Can you fix bad botox? Not always and unfortunately, there’s nothing you can do to fix this Botox mistake, nothing will speed the Botox out of your system, you just have to wait for it to disappear. Other types of Botox mistake like droopy brows can sometimes be fixed – although it does mean having another jab to counteract things. 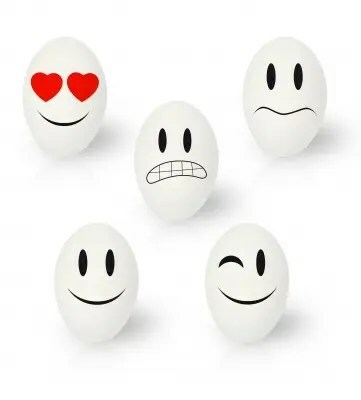 Great, the egg has more emotions than me. My forehead feels really heavy – normally I like the slightly weighty sensation I get post jabs, I find it calming. This however is a bit too oppressive. It is also very strange to not be able to express anything with my face. Even though I couldn’t frown before I’ve at least been able to use my brows to convey whether I’m confused, annoyed or absolutely blooming furious with The Boyfriend. Now he’s going to have to rely on which one of my feet is shaking at any given time (strangely, one of them subconsciously moves when I’m happy, the other one wiggles when I’m angry). I may not be able to wear shoes until June. So, my moral for this story. No matter how many times you’ve had a treatment done in the past, do not assume your ‘treater’ remembers you and knows what you want – and speak up before they start. This isn’t just the case for botox, it goes for haircolour, waxing, facials and massages too. I would look at you with a pleading expression to try and get this message across, but that requires a furrowed brow…..maybe try me in a month or two. If you’re interested in how to find a good Botox doctor in the first place, I’ve written about that too – and suggested the five steps you need to take. Oh, and if your lines are only between your brows, there might be a simple fix for them – well, I say simple, it requires giving up alcohol for a little while as what you might have is Wine Face – I regularly suffer from Wine Face. Have you ever had a Botox mistake? Tell me about it in the comments – and let me know what you did to fix it? If you choose the injector carefully – ie choose a cosmetic doctor or plastic surgeon who does it all the time and talk to them before they have a needle in their hand, explain EXACTLY what you want to achieve (and what you don’t want to look like) and listen to the aftercare rules it shouldn’t go wrong. As I say, my mistake was not doing the second one this time. It doesn’t hurt – I used to hate needles until vanity got the better of me. Now I can have blood tests and everything no problem! Although the ‘you should age gracefully’ lobby would like me to point out that if the wrinkles don’t bother you, then don’t worry about it! Hi Helen. Interesting as I am thinking about having Botox for the first time, and I’m a bit scared. I don’t know how much I want or don’t want – I guess we all have to start somewhere. See the comment I just posted – and, if you can check the archives at my first post on it which explains how I choose my ‘injector.’ I hasten to add, I don’t blame him at all for the result I just had. He’s been excellent up until now. But you need to be very, very clear about what you want to achieve. What lines bother you. Which ones don’t you care about. How much mobility do you want post treatment. If you can’t explain all of those things, your injector can’t achieve it for you. And, if you don’t think they’ve got it, walk away. I went to talk to all my jabbers before I booked an actual appointment. Thank you for the information about Botox. I have thought long and hard about having it done but find it hard to commit to going the first time. The more information I have the more confident I feel. Unfortunately the only people I know that have had it done, I know because they have had too much done in my opinion so I am not going to take their advice. I understand what you mean. I did have a classic moment once when trying to find a new botox doc and mentioning a celebrity I didn’t want to look like – only to discover shortly afterwards that he was her doctor! Thankfully I had already ruled him out or I might have ended up in this predicament some years ago! Thank you, Helen, for being upfront. This is very helpful. I’m at the point where I’m starting to think about Botox. When the lines where just starting, I thought “oh well gotta age gracefully”. But now that they are getting deeper, they’re starting to bother me.